Looking for a steady career in computer programming? Luttrell Staffing Group in Santa Maria is currently seeking candidates for Computer Programmer. Please apply by clicking the link below, then call our office at (805) 928-6555 or send resume to taguilar@Lstaff.Com. 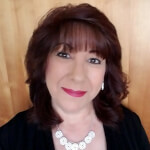 Teresa is the Branch Manager at Luttrell Staffing Group-Santa Maria office. If you're looking for work in Santa Maria or the surrounding area, give her a call!